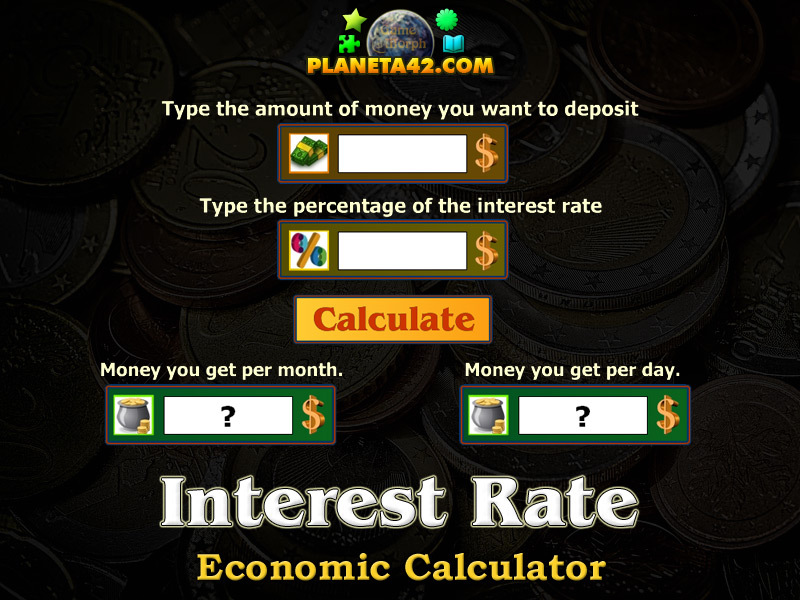 "Interest Rate Calculator" is a free online calculator to find daily revenue from money invested in bank deposits. Calculate interest rate per day and month online. Fun educational economic game, suitable for online lessons and interactive classes. Input the amount of money you want to invest. Input the interest rate written on the brochure. Get the monthly income for the period. Get the daily income for the period. How to play Interest Rate Calculator. There are two white imput fields to enter data and two output fields to get the results. In the upper most field type the amount of money you want to invest into a deposit. Under it type the interest rate written on the bank or company brochure. 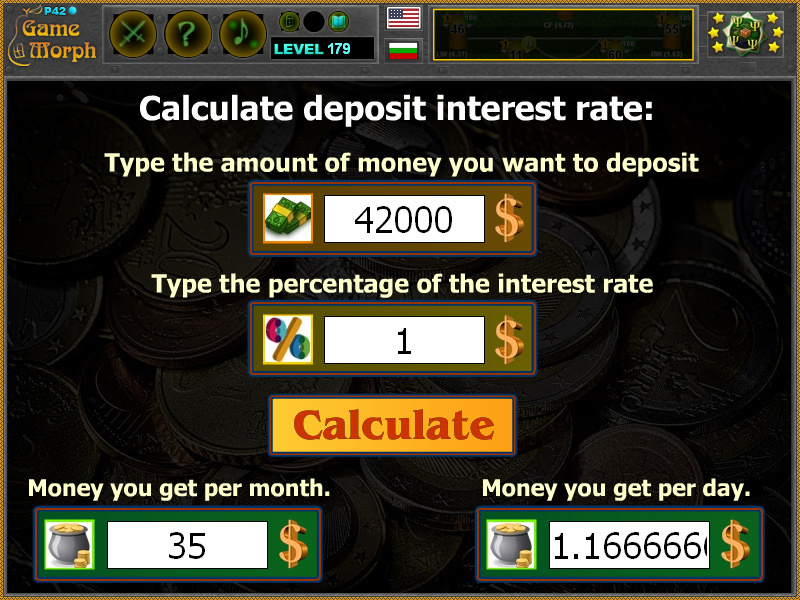 Click the calculate button and you will get a daily and monthly income for the duration of the deposit. If you imput the values in a way that you can make exactly 7 euros (dollars) per day, you will win the game and get one knowledge level. 7 Euro per day is the poverty line in Eastern Europe. Know how to find interest rate revenue and get +1 Knowledge Level. It is defined as the proportion of an amount loaned which a lender charges as interest to the borrower, normally expressed as an annual percentage. It is the rate a bank or other lender charges to borrow its money, or the rate a bank pays its savers for keeping money in an account. The annual interest rate is the rate over a period of one year. Other interest rates apply over different periods, such as a month or a day, but they are usually annualised. This means the interest rates we see on the brochures, no matter the period, are always for one year. 1. How to find interest rate return? 2. How much money do I need to invest to get 1$ per day from a deposit? Labels: Calculators , Economics Games , Education Games , Free Online Games.